Simple intuitive controls let you interactively real-time view and select your desired effect. You can reedit text and effects at any time. Use high impact, anti-aliased text for logos, 2D and 3D headings in letters, presentations, flyers, invitations, cards, faxes, posters, web graphics, labels, banners, buttons, covers. FontTwister supports several popular image formats (.bmp, .jpg, .png, .tif, .wmf). FontTwister is a very compact program (2.8 MB, zipped: 1.3MB). It does not need OpenGL, DirectX or other libraries. 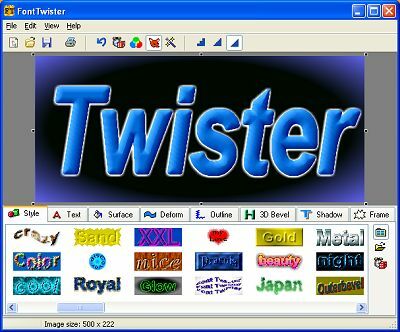 FontTwister is fast, because FontTwister was developed and optimized at a PC with 166MHz, 32 MB RAM. The setup program does not modify your system (does not copy any dll file to system folder or change the registry). If you compare FontTwister with its competitors, then you will find out that FontTwister has the lowest price relative to its feature and quality.